While holding the ball against the wall at about chest height as pictured below. Put your hands on the ball at shoulder height. Step back away from the ball. The further you step back, the harder this ball exercise becomes. You should be straight from your head to your heels and feet flat on the ground, heels on the floor. Use your transversus abdominus to stabilize your spine. If you haven't mastered that go back and work on your abdominal hollowing. Rise up and down on to your toes. Have your heels touch down on each repetition. Maintain a straight back to prevent back injury. Calf Raise 1 is easier if you find this difficult. Try Single Leg Calf Raise. 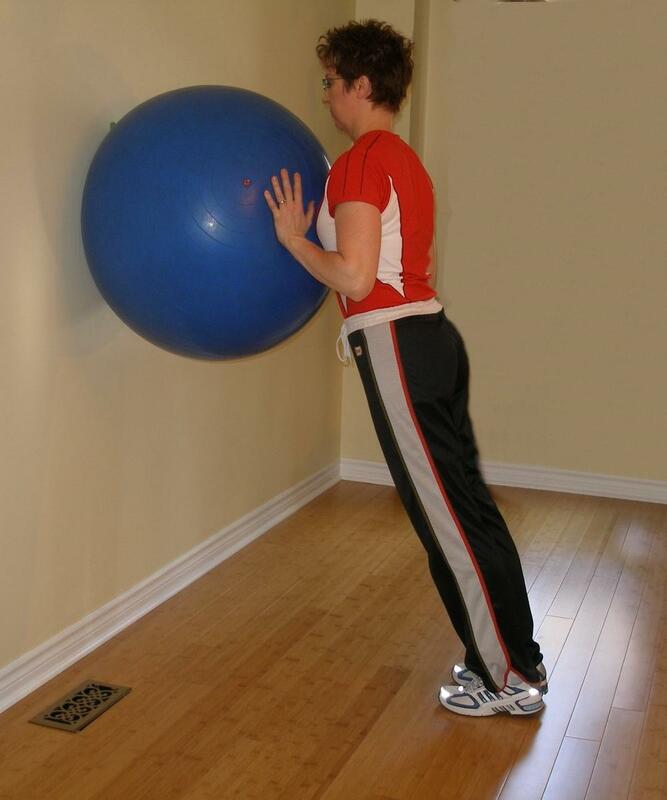 Try stepping further away from the stability ball. Try performing this exercise with straight arms. Try it with one straight arm.